New York City. Home to more than 8 million people and countless landmarks. Over 50 million visitors travel to NYC every year to see Times Square, the Empire State Building and everything NYC has to offer. 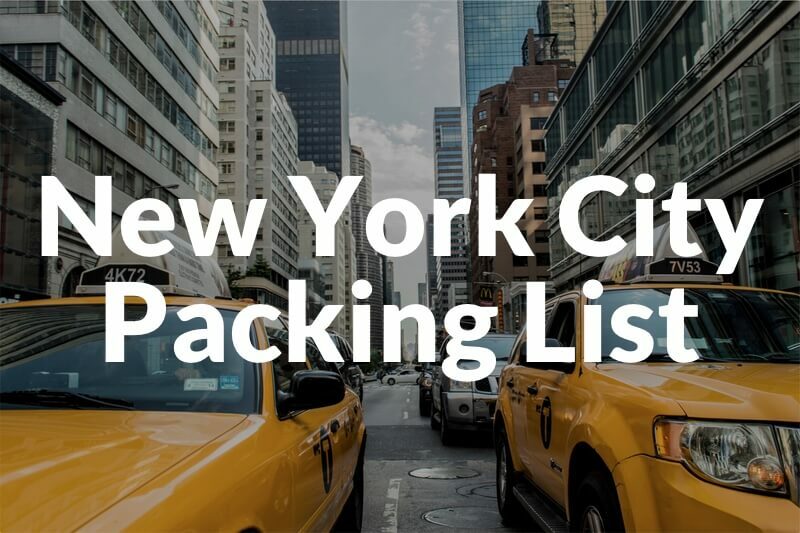 This New York City packing list includes all you need to know about what you should pack when visiting NYC, regardless if you’re a man or woman or if it’s winter, spring, summer or fall. 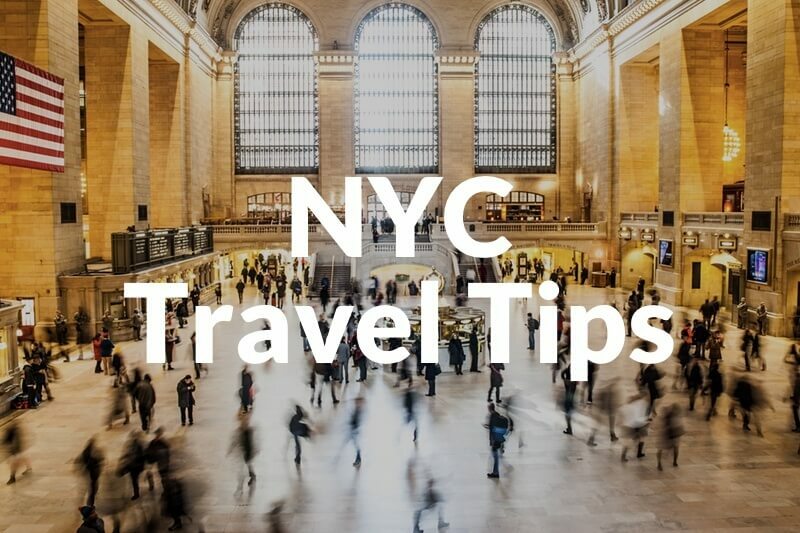 We’ve included some helpful NYC travel tips here as well, written by a New York City local. 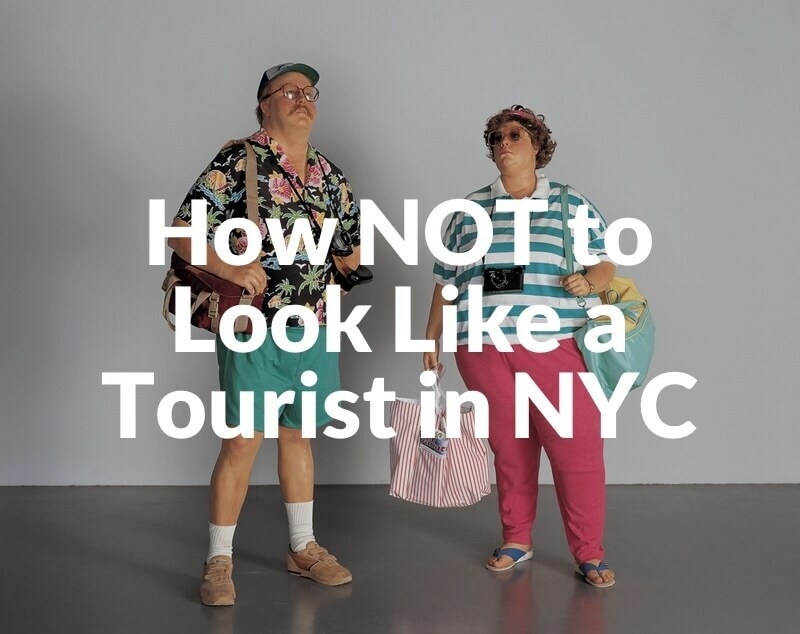 Ever wondered how not to look like a tourist in NYC, or how to avoid pickpockets? This guide has it all. Feel free to use the table of contents at the left when you need to quickly jump to a part of the guide. When planning what you should pack for your trip to New York City, be sure to get a feel of how the weather will be when you’re there. 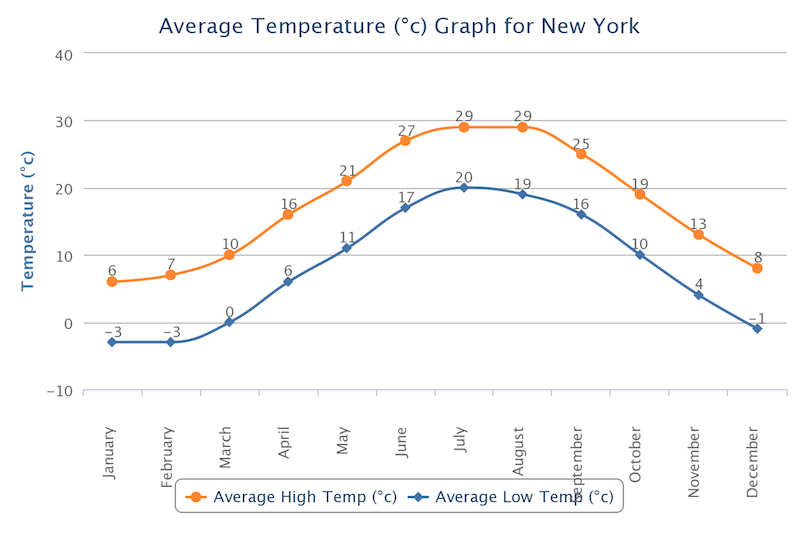 The temperature in New York City ranges from super hot and humid in the summer to below freezing in the winter. Pack layers in case the temperature swings during the day, as it can in the city. If you’re heading to NYC in the summer, you’d want to pack primarily lightweight dresses, comfortable lightweight pants and short-sleeved shirts. In the winter, don’t forget to bring your warmest jacket as well as a hat and gloves. We’ll go over clothes in more detail later. Click here for the Celsius version. 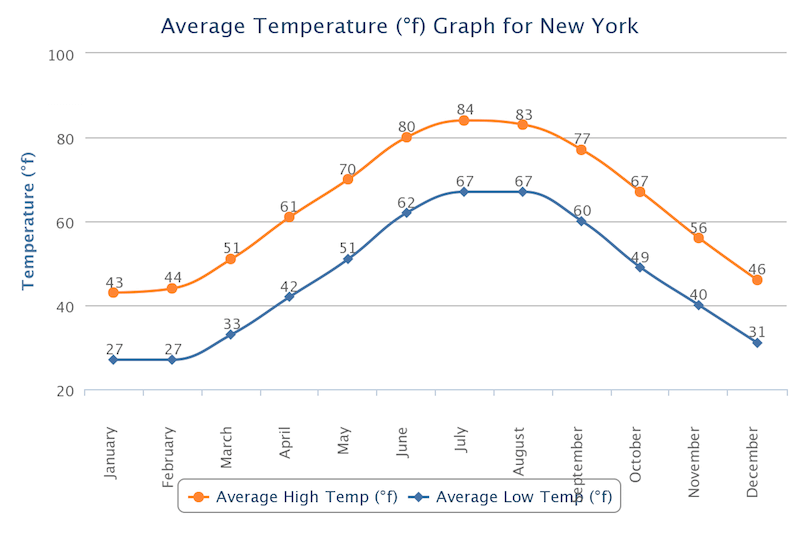 Although the average high during the summer in NYC is around 84(°f), it can get well into the 90s on a particularly hot day. The same goes for the winter, temperatures can get even colder than the average low of 27(°f). June, July and August are the hottest months and December, January and February are the coldest months. Remember that when visiting in the summer, you have more daylight hours as the sun usually rises between around 5:30 am – 6:30 am and the sun sets at around 8 pm. In the winter, the sun rises around 7 am and sets around 5 pm. Lots of activities in New York City are outdoors, so you’ll want to organize your travel plans around rainy days. 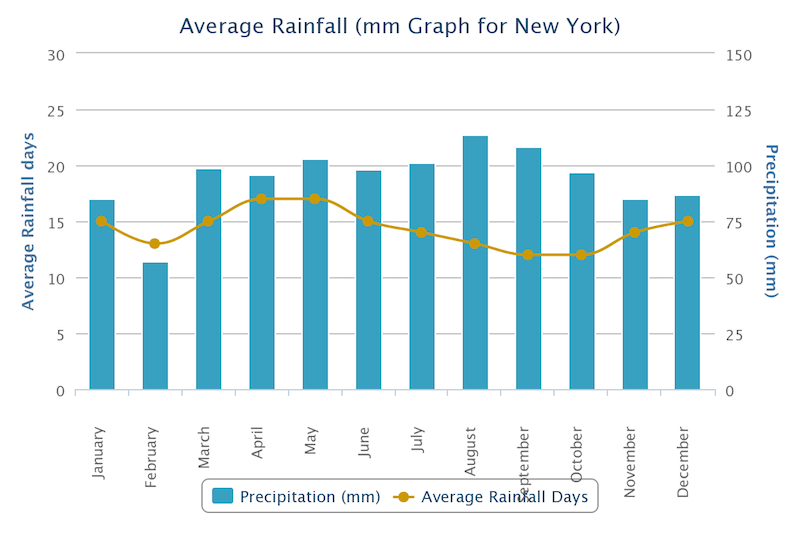 As you can see from the graph below, there isn’t one really rainy season, rainy days are mainly spread out. It can snow a lot during the winter and even towards the spring as well. Click there for the Millimeter version. 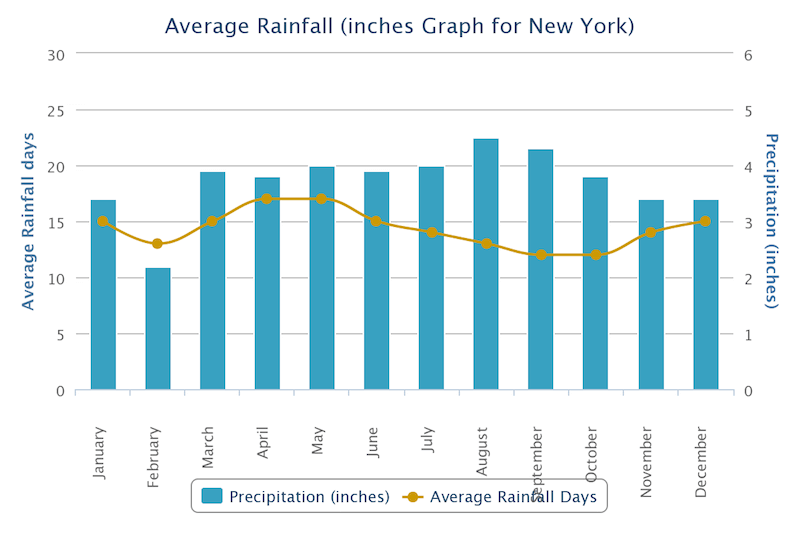 You might want to bring a rain jacket or umbrella when visiting New York City. We suggest you check the weather forecast before your departure. Or, you could probably buy an umbrella for $10 or less while in New York. Depending on your style of travel, you may want to bring either a hard-sided suitcase or a backpack. 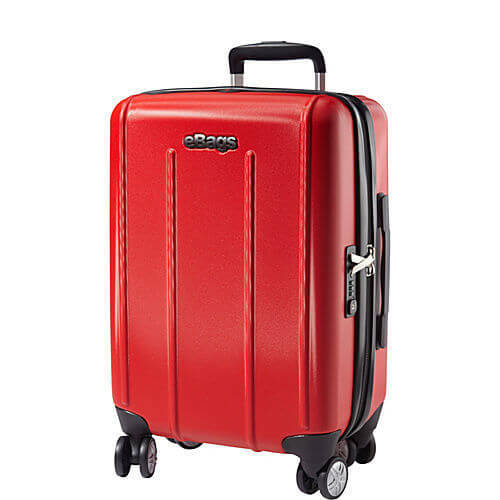 Since you’re traveling to a big city, I’d recommend taking a spinner suitcase which is easy to transport and have large capacities. You may want to check out the eBags EXO 2.0 Hardside Spinner, or the Samsonite LIFT Spinner, both of which are durable spinner suitcases. 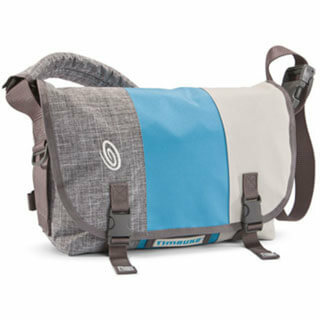 REI Flash Pack 18 – an inexpensive and lightweight day pack which can be packed when not in use. Read my review of the Flash 18 here. 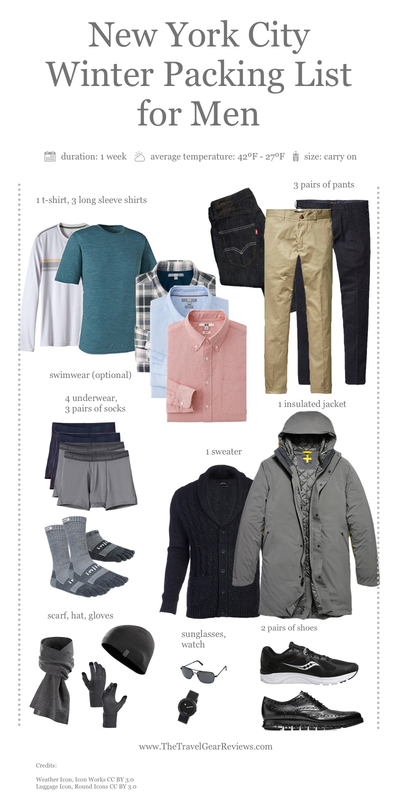 These are lightweight packing lists for one week in NYC. Feel free to pack more clothes if you feel necessary. If you’re traveling to New York for a different duration, add or remove clothes accordingly. This includes what you’ll wear to the airport. Winters in NYC can be brutal, but you should embrace the cold. There are lots of winter only events in New York City like ice skating in Rockefeller Center, the Radio City Christmas Spectacular and the New Year Times Square Ball Drop. Snow is common and should be expected. Salt and other melting agents are added to the snow and ice which make the ground slushy and wet. That slush usually mixes with dirt and other junk to create a disgusting brown mixture. It starts to warm up in the spring, however you will still want to bring gloves and a hat, especially if you’re visiting during early spring. It’s known to snow occasionally during the spring, so it’s best to be prepared. Summers can be hot and humid. Take mainly short sleeved shirts and a sweater in case it gets cold at night. The weather in NYC during the fall is quite similar spring, so bring similar clothes. Note: These are all just suggestions, so adjust the number of each clothes according to your needs. These are lists of what I would take to NYC. Remember to check the weather forecast prior to leaving for NYC. 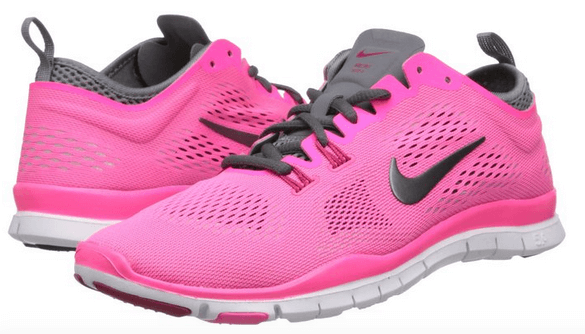 When traveling to New York City, you’ll want to take a comfortable pair of sneakers for walking in. 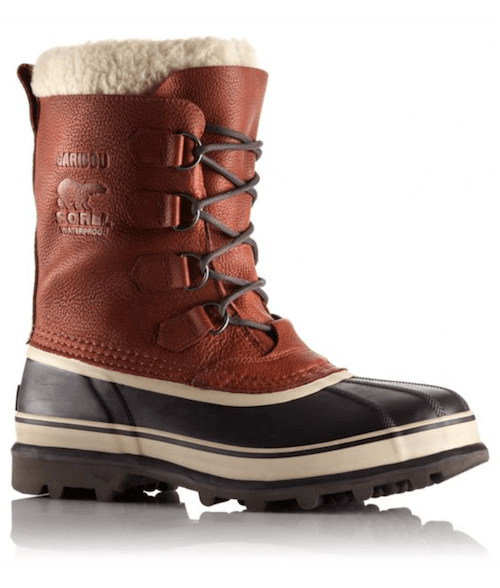 If you’re traveling during the winter, it’s a good idea to bring a warm and waterproof pair of boots. It snows a lot in NYC during the winter and streets and sidewalks can be filled with snow, ice and brown slush. 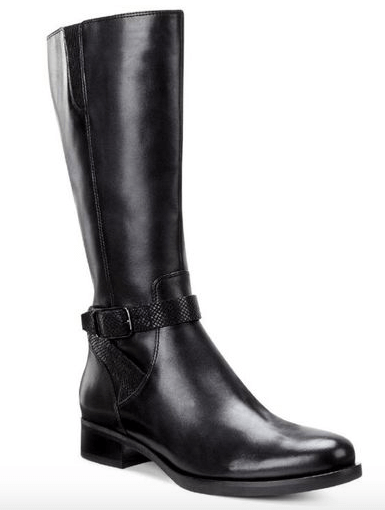 Also, in the spring it tends to rain, so you may want to bring waterproof shoes although this isn’t essential. Also, you may want to bring a pair of flip flops or sandals for wearing around the hotel or when it’s hot outside. 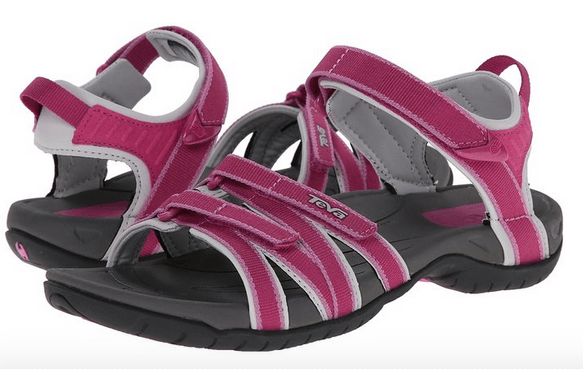 Flip flops or sandals lightweight and easy to pack with you. 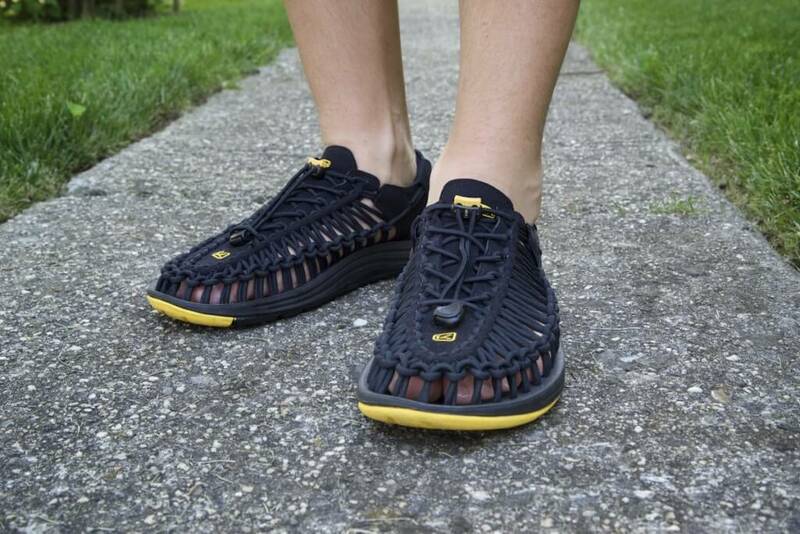 I wear the KEEN Uneeks, which are versatile sports sandals that can be worn around the city, in the water, and everything in between. 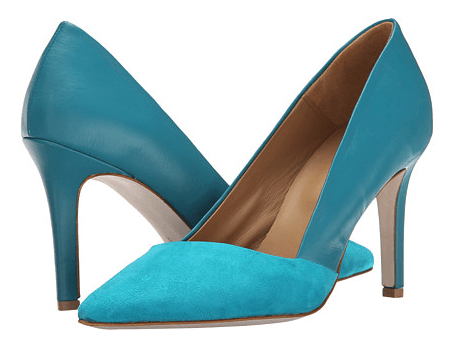 If you’re planning on dining out at a fancy restaurant or are feeling especially spiffy, you might want to pack a pair of dress shoes. 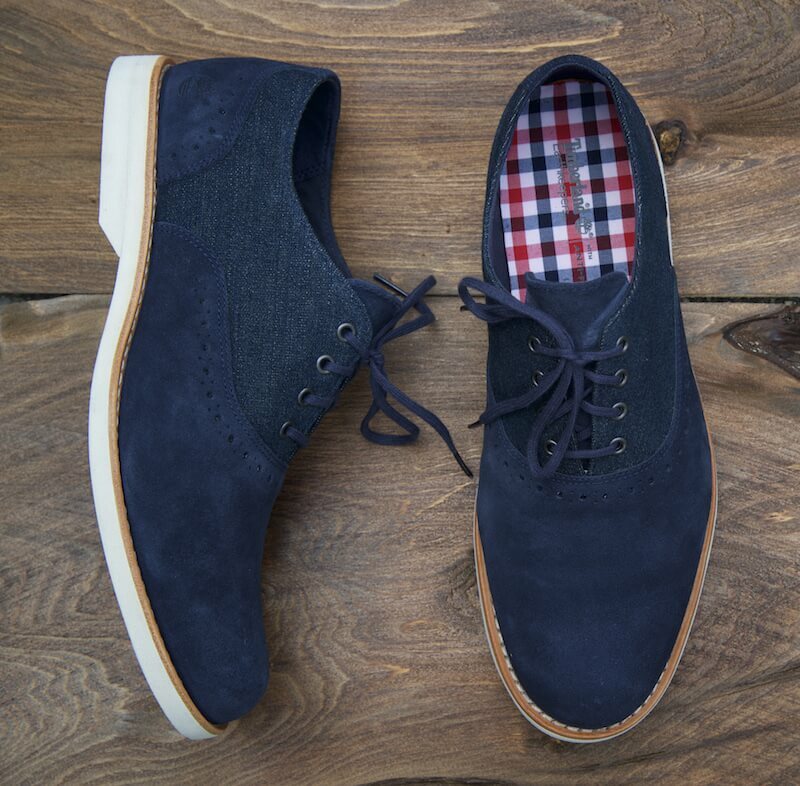 I wear the Timberland Stormbuck Lite Brogue Oxfords which are comfortable, stylish and lightweight. 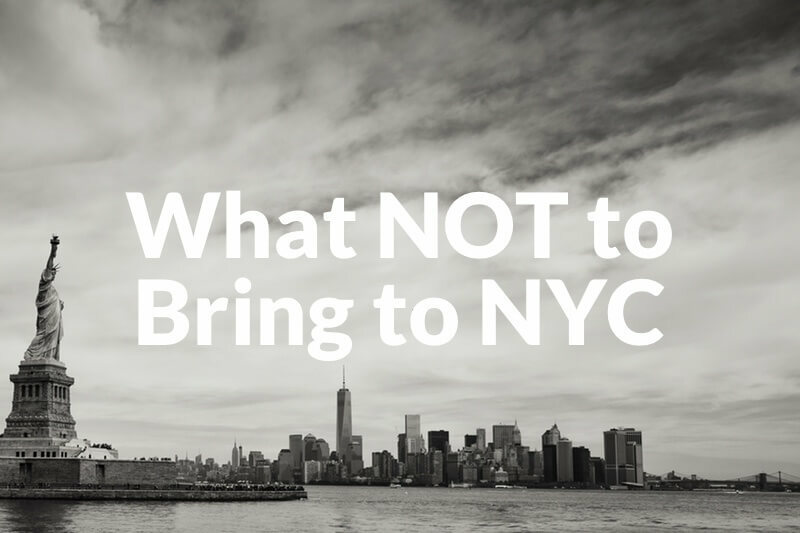 When in NYC, you’ll find hundreds of places to buy toiletries, so don’t overpack in this area. We usually carry small bottles that fits in a quart ziplock bag (TSA 3-1-1 liquid rule). 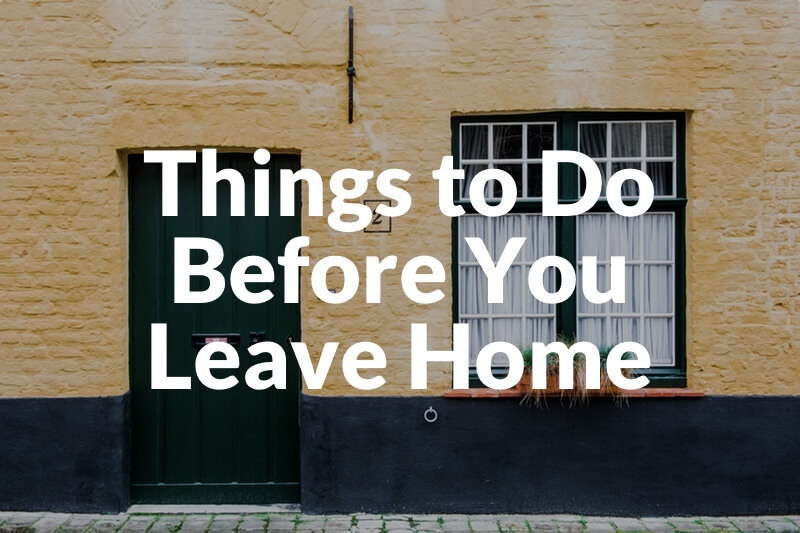 Most travel sites say you should leave your valuables and electronics at home, and for the most part that advice is correct. In New York City, most people have the newest iPhone or the latest gadgets – in fact the homeless guy across the street probably has a smartphone. You shouldn’t be afraid to bring your phone, laptop or other electronics to New York City as long as you use common sense and don’t flash your valuables when in sketchy areas. The chances are everyone already has what you have. 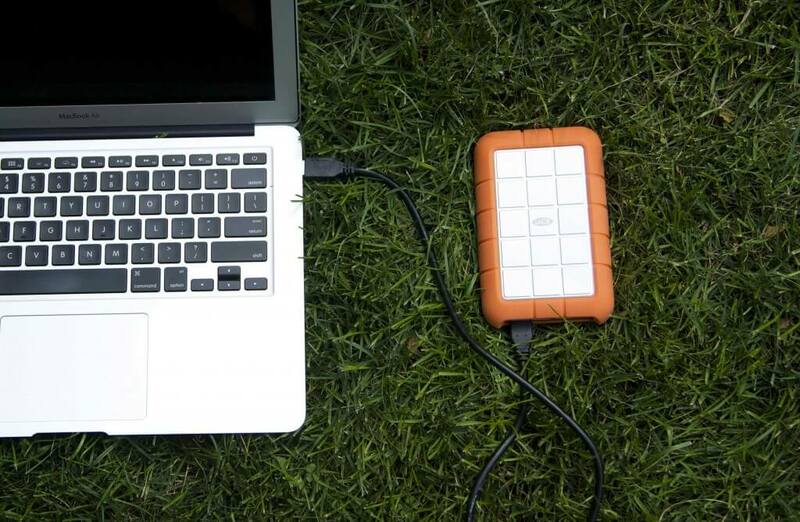 External battery – to keep my electronics powered up on the go, I have the Anker External Battery, which can recharge an iPhone about 4 times and an iPad 2 once. You can find wifi in most cafes, all libraries, a few restaurants and in many NYC subway stations. Sunglasses – New York City can get very sunny, so you would probably want to bring a pair of sunglasses. Inform loved ones or reliable friends about your vacation and leave your itinerary including hotel phone number to one close member of the family or friend. 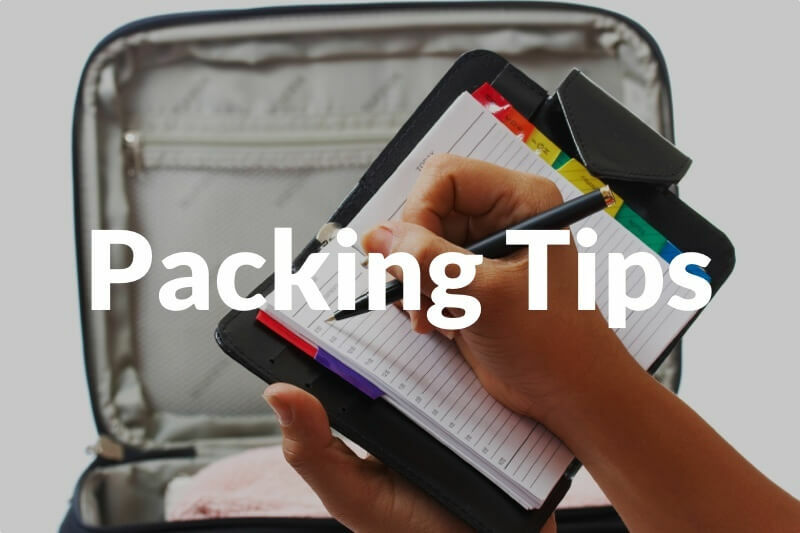 We don’t like complex packing tips. There’s no real secret to packing light. Just take less stuff. When we travel, we usually roll our clothes. It makes clothes more compact although we’ve noticed it makes clothes more wrinkled. I (Jonathan) always use packing cubes. 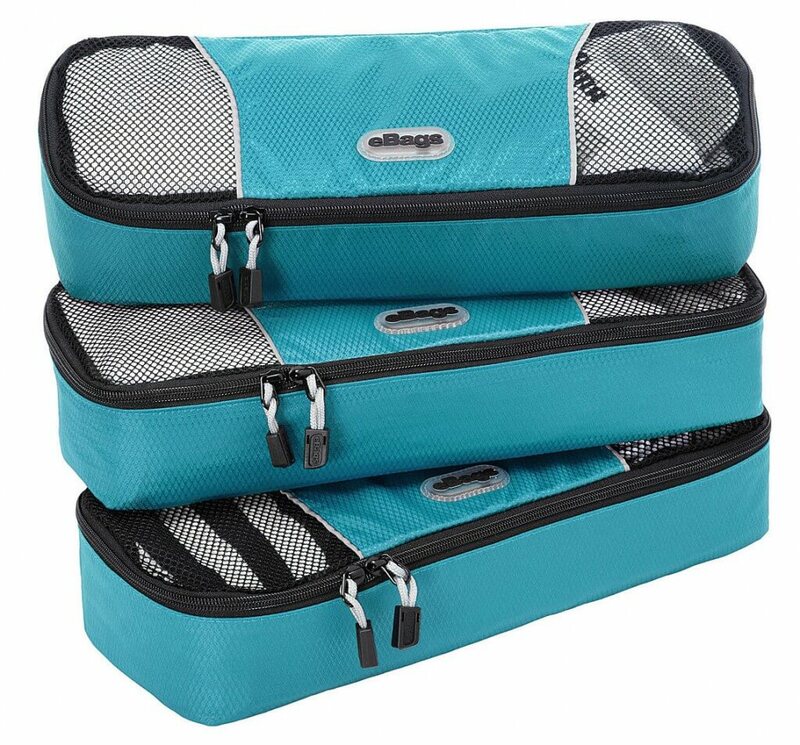 They’re helpful for organizing clothes and other accessories. If you’re not into packing cubes, you might want to check out my mostly free packing cube alternatives. Don’t bring ‘just in case’ items. If you end up needing something, you can easily buy it in one of the million stores in the city. In fact we recommend you do so. Big bottles of soap and shampoo – there are pharmacies and convenience stores like Duane Reade and CVS on the corners of almost every block in New York City, you won’t have trouble finding soap or shampoo. You can buy anything in New York, in fact, many tourists visit solely to shop. All hotels provide these essentials and some AirBnB apartments provide as well. Unfortunately, there’s lots of regulations on the types of knives you can possess in while in the city, so you might research about the laws before bringing your EDC, or whatever type of knife you have. Visit this site a list of the regulations. Don’t bring umbrellas that golfers use. They are too big in crowded NYC streets. We tend to walk very fast and may get in the way. Food and snacks – there is an incredible selection of restaurants and eateries, so there shouldn’t be any need to pack food or snacks with you unless you have special dietary needs. There are plenty of health food stores in NYC too. 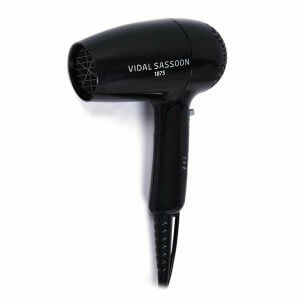 Hair dryer (unless you really need it) – the chances are your hotel will have this. Hair dryers are heavy and take up lots of space. Photo Credit: http://www.saatchigallery.com/artists/artpages/duane_hanson_tourists_2.htm | Tourists II by Duane Hanson | These are figures made of fiberglass by Duane Hanson in 1988. To be honest, it takes a lot to look like an idiot in New York City. There are so many people doing so many weird things in this city that pretty much everything goes. 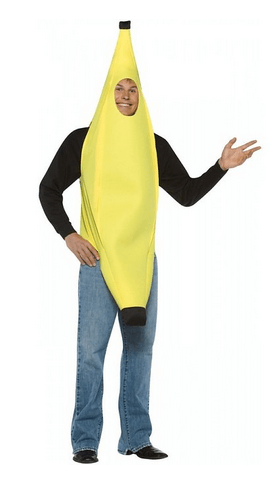 Whether you’re wearing a really nice dress or a banana costume, no one will care. Let me clarify this before I get into what you should and shouldn’t wear or do: There’s nothing wrong with looking like a tourist. Tourism is a vital aspect of the New York City economy, so it wouldn’t make sense for a New Yorker not to like tourists. With that said, tourists in New York sometimes have bad stigma for being annoying. Some people don’t like it if you get in the way or stand in the middle of the sidewalk. Other than that, you’d have to do something really stupid or obnoxious to tick everyone off. Dress up like you’re going to work – lots of people working in Manhattan actually live in Long Island or New Jersey which are outside of the city. These people go to the city for work and therefore dress up to go to work. If you can dress like a commuter, you’ll look like a New Yorker. This is especially the case in Downtown Manhattan where Wall Street and other financial areas are located. This isn’t really feasible for most visitors, but if you really wanted to blend in, this is what you’d do. 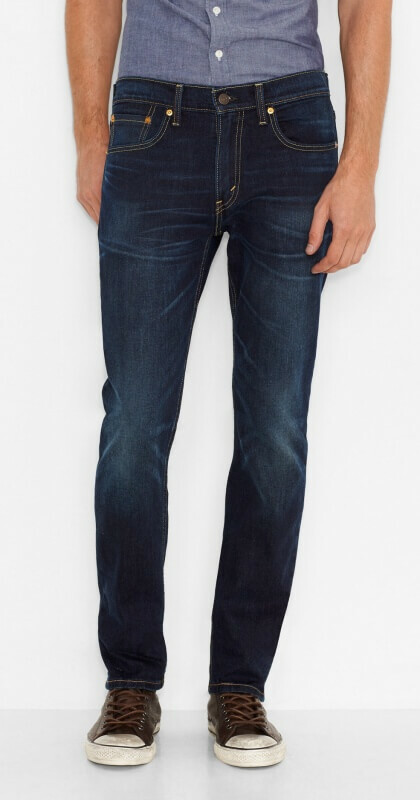 You’ll blend in with a pair of jeans. The pair above are Levis 511s. If you’re wearing a backpack while in a crowded subway car, take it off and hold it to save space and to keep from bumping into others. 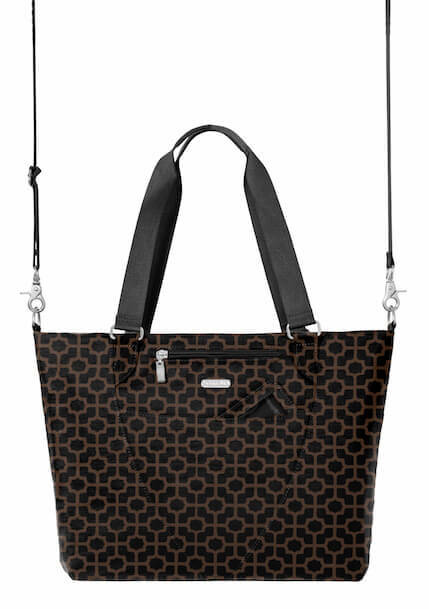 This also helps you to keep your backpack in sight, preventing pickpockets. Escalators are for letting you walk faster, not for you to stand idly – alright this is an exaggeration, but if the rule of thumb goes like this: Walk on the LEFT, Stand on the RIGHT. If that’s too complicated, just copy what everyone else is doing. In crowded sidewalks, walk on the right, not on the left. Get your Metro Card (card to pay to use the subway) ready before standing in front of the turnstile. This allows you to seamlessly go through the turnstile without holding up others. 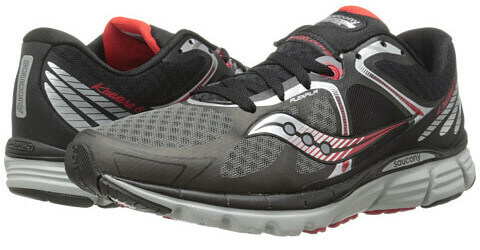 It is cheaper and more convenient. Check with MTA for the weekly passes. Never, never, never take photos with an iPad or tablet. Or worse, take videos with an iPad. Regardless if you’re a tourist or not, you’ll look like an idiot if you do it. Don’t use a physical map – if you need to use one, make sure it’s on your phone. Don’t pull out your guidebook – nothing screams tourist more than someone reading a NYC guidebook in the subway. When inside the subway car, don’t take up several seats with your bags and when holding the pole for balance in the car, leave space for others. Don’t stare at people, it’s weird and can be taken as offensive. Don’t walk in big groups – this might not be possible for you, but if you’re alone, you blend in more. A lot of times, when walking with my family, it automatically makes us look like tourists. Don’t fall for sidewalk scams, like the people trying to give you hip hop CDs. See more NYC scams here. Also, you might come across people with clipboards trying to get you to support a cause or fill out a survey. Some of these people are legit, however be prepared to waste some time hearing what they have to say or giving out your information. Don’t walk around with a water bottle. Basically, the main way to not act like a tourist is to not slow others down or get in the way. It’s difficult not to look like tourists when traveling with a family or in a group. Even though I live in the city, if I go to Midtown with my family, salespeople will usually still try to hand out flyers and sell tours to us. Depends. Most people are busy, a lot are stressed out, but for the most part people are nice. If you ask for directions, people almost always will help you out. If your idea of rudeness is strangers not saying ‘hello’, then prepare to be disappointed. Unfortunately, it’s not practical to say ‘hi’ to everyone if there are 8 million other people. Other than that, New Yorkers are generally decent people. Pickpockets aren’t as major of a problem in NYC as they are in other cities throughout the world, but there is always a possibility. Just be smart. Crowded places like Times Square or in the train during rush hour are potential pickpocket sites. Be aware of all your belongings and make sure they’re in sight. 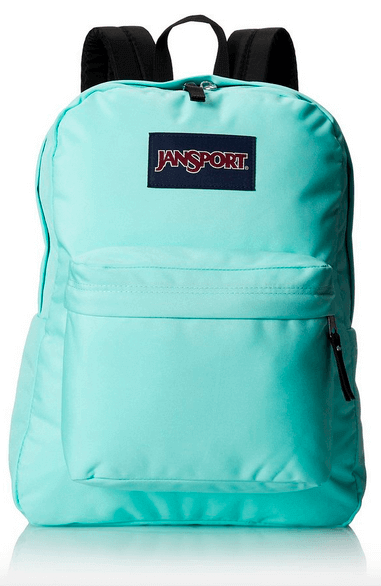 It isn’t necessary to wear your backpack on the front unless you are in crowded streets or shops. On the subway taking your backpack off not only helps you not to bump into others, it helps you to keep your bag in sight. Avoid walking on quiet streets during the night, try to use ATMs during the day and always stay alert. One of the best things to do while in NYC is to go on a Big Onion walking tour. Around last year I went on their Financial District tour, which covered Wall Street and other parts of downtown. Although I live in New York, I still learned about a ton of things during the tour. The Metropolitan Museum of Art – This is a really cool museum. Like the Louvre, you could spend days at the Met. The MOMA (Museum of Modern Art). The Guggenheim Museum – Honestly, I didn’t really like the Guggenheim Museum. There was a protest inside the museum when I was there, which made a overall boring museum visit more interesting. Read my comparison between the Met and the Guggenheim. Wall Street and the Financial District. Most stores and restaurants only let customers use their restrooms, and some don’t even have restrooms. If you’re looking for a bathroom in Manhattan without having to buy anything you don’t want or need, stop by the flagship Uniqlo store, the Trump Tower, Rockefeller Center or any public library to use their restroom for free. There are many other free bathrooms, but those are some convenient places. Go to the REI in Soho if you’re into outdoor and travel gear. That’s an awesome store. Another choice is Paragon Sports on 18th street and Broadway near Union Square. We can’t possibly cover all the information you need about New York City however, we’ve come up with a list of other helpful NYC resources. For more travel tips, sign up for our weekly newsletter where we share exclusive tips about gear, traveling and more. 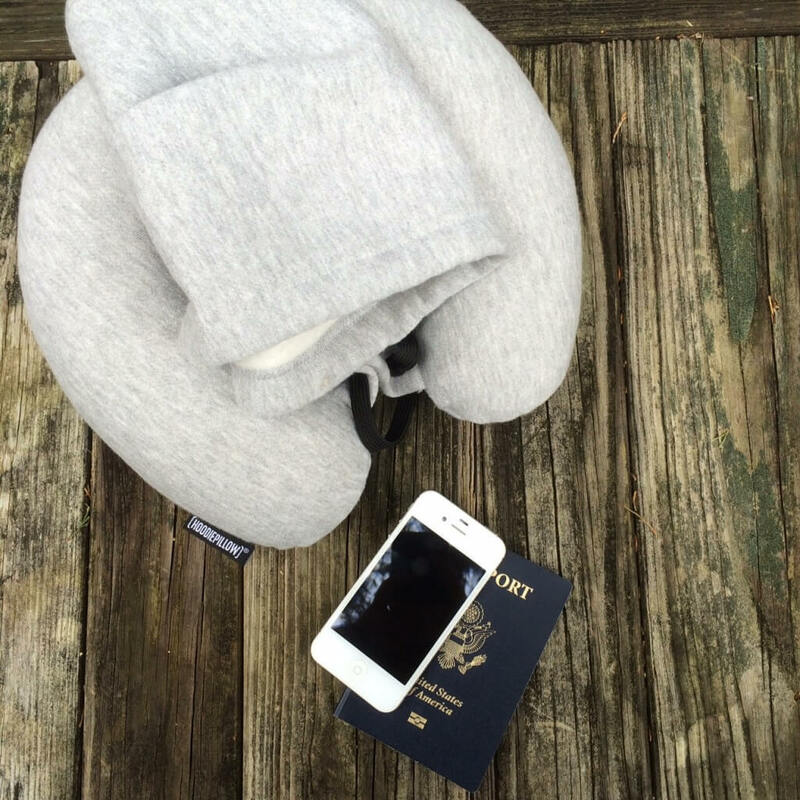 Did you find this NYC Packing List helpful? Leave a comment below, and please share it with your friends.